The ongoing conflict in Yemen created a unique and remarkable mixed migration dynamic between the Horn of Africa and Yemen. While over 86,000 people fled Yemen to the Horn of Africa, the flow of Somali and (primarily) Ethiopian migrants and refugees travelling from the Horn of Africa in the exact opposite direction, towards the conflict in Yemen, continued unabated, with one of the highest recorded numbers arriving in Yemen in recent years. 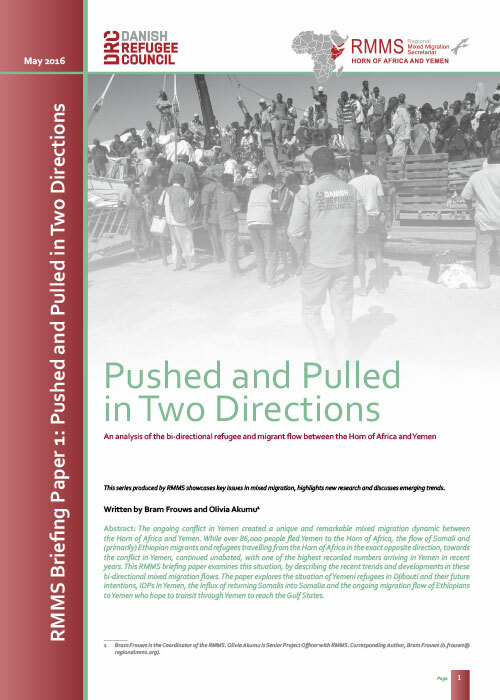 This RMMS briefing paper examines this situation, by describing the recent trends and developments in these bi-directional mixed migration flows. The paper explores the situation of Yemeni refugees in Djibouti and their future intentions, IDPs in Yemen, the influx of returning Somalis into Somalia and the ongoing migration flow of Ethiopians to Yemen who hope to transit through Yemen to reach the Gulf States.